When it comes to branding, we’d argue that nothing could compete with the backside of a device. Here’s why: the average person engages in 8000+ public phone calls and text messages a year. That’s a lot of impressions. In fact, it’s more impressions than the SuperBowl delivers. And way less millions of dollars. Win – win. Watch the video below to see a PopSockets Grip in action. Can I resell my promotional PopSockets Grip order? Promotional PopSockets grips are to be used exclusively as giveaways; only authorized vendors are permitted to resell PopSockets grips. If you're interested in reselling PopSockets grips, please contact info@popsockets.me. Where are PopSockets grips manufactured and printed? The individual PopSockets grips pieces are manufactured in China. 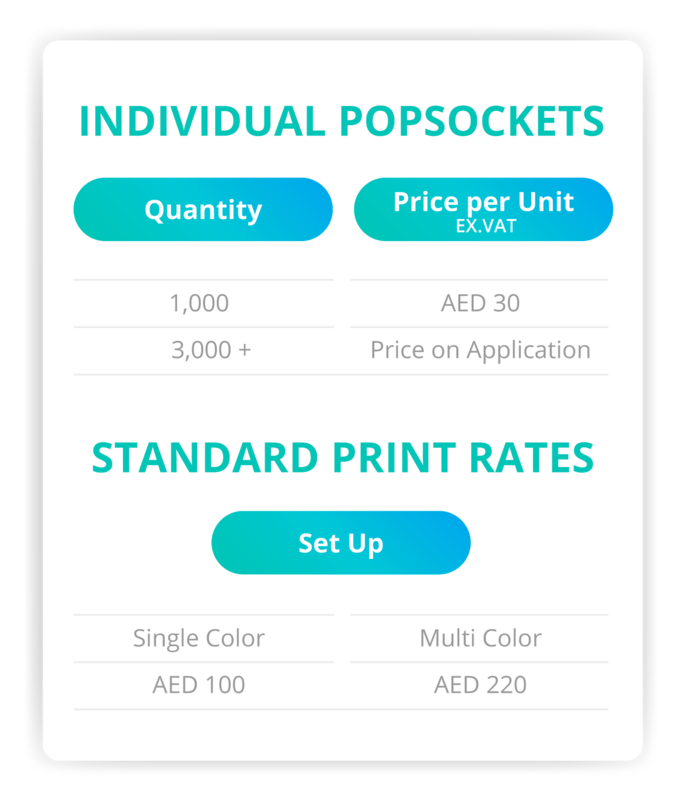 Your custom logo will be printed at the PopSockets production facility in Dubai, UAE. It will take approximately 2 weeks from the time the order is placed to when it is delivered. Ground shipping by Aramex is free within the UAE. Expedited shipping and International shipping will vary in cost depending on quantity and location. Yes, we are able to ship internationally within the GCC, but we ship with delivery duties unpaid. Prices do not include shipping or import fees. Can I order less than 100 units? We have a strict minimum order quantity of 100 for printed graphics on our standard plastic grips. What are your payment terms for domestic orders? For online orders, we require payment by credit card / cash on delivery when the order is placed. If you are needing to submit payment via check, bank transfer, or issue a PO, please reach out to us at Orders@PopSockets.me and we'll be happy to assist with your order. What are your payment terms for international orders? For online orders, we require full payment by credit card when the order is placed. If you are needing to submit payment via check, bank transfer, or issue a PO, please reach out to us at Orders@PopSockets.me and we'll be happy to assist with your order. Will my customers like PopSockets grips? Is the sky blue? Yes, the odds are high that your customers will love PopSockets grips -- a typical comment from our customers after using PopSockets grips for a couple days is, "I'll never go back to using my phone without a PopSockets grip." Standard production uses an off-white button, or a black button. The accordion and platform can be either white or black.